I will have been married to Mr. Hubby Man 9 years this summer and he always promised to buy me the ring of my dreams for our 10 year anniversary. I like to plan ahead. So just wanted to share the ring of my dreams, which will stay a dream as it is so expensive, it's just never going to be seen on this ring finger. 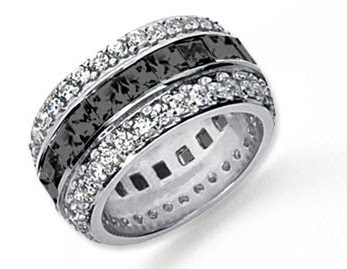 It is soooo me, this ring, 5ct of white and real black diamonds on a really thick eternity band. I love it so much. Sorry have not had a chance to finish covering the big a** ottoman/day bed thing in my salon yet. Ran out of tacks and have not had a chance to get more. This week has been hectic for me, busy 24/7. Will post again next week! Which Bag and Shoe Combo to Choose?